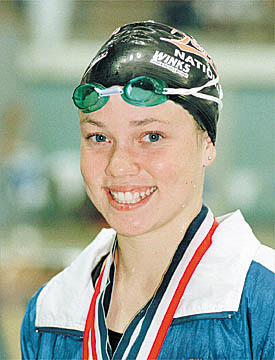 COLLEGE STATION, Texas - Megan Quann completed a sweep of the breaststroke events with a record-breaking performance at the 1998 U.S. Open Swimming Championships. On the first day, Quann, 14, from Puyallup, Wash., broke Tracy Caulkins' 17-year-old American record in the 100 breaststroke as well as the American mark for the 50 breaststroke at the halfway point. She did it again, winning the 200-m breaststroke in 2:25.52, snapping 1996 Olympian Kristine Quance's American, U.S. Open, and meet records from 1993. Sixth fastest American long course 100 breaststroker, won Phillips Performance Award at Spring Nationals after dropping four seconds from previous best. During the week, there were 3 World and 14 American records set in the two days of World Cup swimming and three days of the U.S. Open. The Phillips Performance Award for the meet's single outstanding swim went to Belgium's Fred deBurghgraeve, who on Thursday set the first world record in the U.S. Open meet since Janet Evans in 1987. 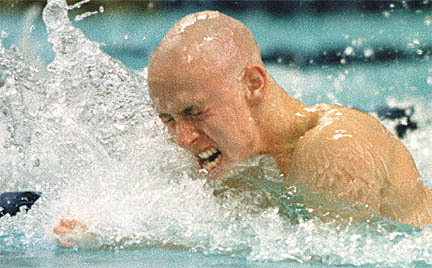 The 1996 Olympic and 1998 World Champion went 58.79 in the 100 breaststroke to crush his own world standard of 59.02 from 1996. Terrapins' Natalie Coughlin won her fourth event of the meet on the final night to wrap up the women's high point trophy with 97 points. She won the 200 butterfly by over four seconds with a 2:08.32. Earlier in the meet she won the 400 individual medley, 100 and 200 backstroke events, plus was second in the 200 individual medley. Seventh fastest all time American 100 backstroker and 200 individual medley. SMU's Martina Moravcova won the 100 freestyle with a 54.23, a meet record, which gave her three individual titles on the week and her fourth meet record. 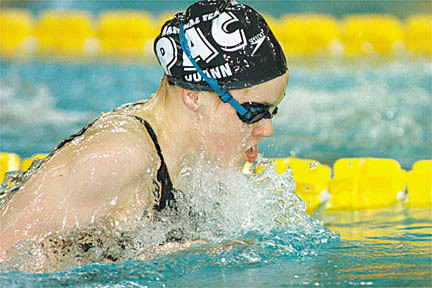 Earlier in the meet she won the 100 butterfly and 200 individual medley, both with European records. 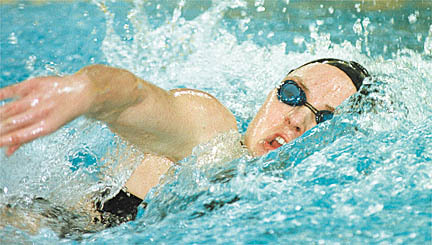 She also swam on all three winning relays. Leading off the Mustang 4x200 freestyle relay on Thursday, she set the meet record in the 200 freestyle. Martina Moravcova (SVK) and Southern Methodist swam to European record in 200 I.M. The men's high point trophy went to Tom Wilkens of the Santa Clara Swim Team, who won the 200 breaststroke for his second win of the meet. Wilkens swam 2:10.76. He also won the 400 individual medley, was second in the 200 IM, finished sixth in the 100 breaststroke, and took seventh in the 200 butterfly, scoring 82 points. Sabir Muhammad, a member of the USA Swimming Resident Team, won his second event of the meet with a 48.91 in the 100 freestyle. The previous night, Muhammad won the 100 butterfly with an American record. Lake Erie Silver Dolphin's Diana Munz won the evening's first event, the 800 freestyle, in meet-record time with an 8:26.14. Yann DeFabrique (FRA) of the Athens Bulldogs won the men's 200 butterfly with a 1:59.06. The men's 1500 freestyle was won by 1996 Olympian Ricardo Monasterio of Venezuela and the Indian River Community College, who set a meet record of 15:03.53. The SMU team of Rania Elwani (EGY), Naoko Imoto (JPN), Lia Oberstar (USA), and Martina Moravcova (SVK) won the women's 4x100 freestyle relay with a 3:44.13. Texas A&M won the final event of the meet with another meet record. The team of David Morrow, Jerrod Kappler, Riley Janes (CAN), and Ken Kehlenbach went 3:18.33 to nip the USC squad by just 0.02 seconds, the closest race of the week. Josh Davis, Texas Aquatics, had a remarkable week. He won the 200 free, 200 back, and 200 IM at the US Open, and the 200 back and 100 IM at the World Cup. He bettered American records in the 200 free with 1:45.24 and the 200 IM with 1:56.66. Southern Cal swept the men's and combined team titles in the university division, with Southern Methodist claiming the women's title. The Bolles Sharks of Jacksonville, Fla., won the women's and combined club titles, with Island Swimming of British Columbia taking the men's club crown.